Jean-Marie Cannie is the CTO and co-founder of Image-Line. 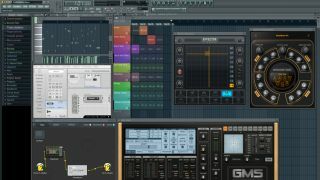 The firm's flagship product is the FL Studio DAW (now in its 11 iteration), plus Deckadance DJ mixer software and, more recently, app-based versions of those programs. How important is touchscreen functionality for serious music software? "We have to distinguish music production and music playback/performance here. For music production, it's always going to be a bit fiddly to control hundreds of knobs and sliders in a precise way using a touchscreen. "For musical performance, however, we see a very bright future, as FL Studio 11's Performance mode allows some exciting and unique ways of triggering clips visually on screen, with close to zero latency, as you can see here…"
Will the full FL Studio experience ever be possible on a phone/tablet? "With almost 200,000 users, we can say that FL Studio Mobile is a true success on iOS, and we just released it on Android, where the results seem to be similar. The problem, however, is that the CPUs of portable devices are still far from those of personal computers, and as soon as you start mixing a couple of dozen tracks, plus effects and a synth or two, they run into trouble. Considering that we had to increase the number of tracks in FL Studio 11 to 200 for power users, we've still a long way to go." Did you approach FL Studio 11's touchscreen functionality as a replacement for the mouse or an accompaniment to it? "It would be very hard to make a desktop app fully work on a tablet - they're not the same kind of app and don't differ just by input system. "The clip-triggering performance part works very well. In performance mode, you can trigger as many clips as your hands (and monitor) allow at once, with per-clip X/Y control and a group of clips triggering through custom gestures. Since the playlist is freely zoomable, this already works perfectly on any type of touchscreen/tablet as an alternative to a MIDI controller." FL Studio is spectacularly feature-packed nowadays. Is it getting difficult to come up with new ideas for it? Any clues as to future plans? "We've been getting about ten feature requests a day for almost 15 years now, so we can't say we're out of ideas already. We generally don't disclose any future plans; there's still a lot of room for improvement in the video area and in MIDI scripting, but that's about all we can disclose." Are there still no plans for Mac or Linux versions of FL Studio? "Mac has become more important for live performance, so it's become more important for us as well. We currently have a version of FL Studio that works natively on OS X, but it'll need some more testing before we decide what will happen to it. You can expect to see this pretty soon..."